As the very first county chorography, the Perambulation of Kent shares in and contributes to the general formation of local consciousness with which the previous chapter has been concerned. But Lambarde’s text is a fascinating social and political document in its own right that reflects the highly charged historical moment in which it came into being. William Lambarde completed the Perambulation of Kent in 1570, the same year the Northern Rebellion was raging. 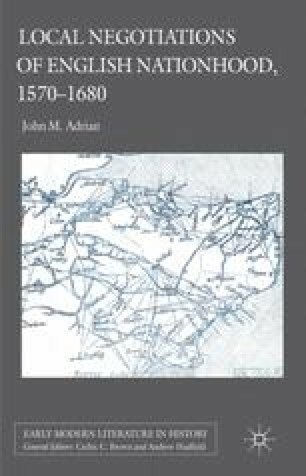 Already in the author’s lifetime, England had endured major uprisings in the North, the West Country, and in East Anglia.1 Lambarde’s Kent had also seen its fair share of recent tumult. In 1548, 1549, and 1550, Kentish commoners camped in large numbers and ‘threatened to follow their counterparts in East Anglia into armed rebellion’ over enclosure and other local grievances.2 And in 1554 a contingent of county men led by Sir Thomas Wyatt the younger marched on London to oppose the Queen’s Spanish marriage. It is little wonder then that Lambarde’s Perambulation — though primarily an antiquarian and chorographical work — exhibits a manifest concern with order. When Lambarde began writing in the 1560s, ‘the fences [in Kent] were long since back in place, but obedience could not be taken for granted.’3 Recent destabilizing events, coupled with Lambarde’s own ambitions for joining the local governing class, prove to be formative influences on the Perambulation of Kent.